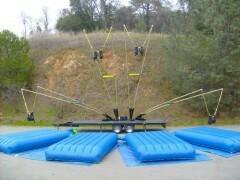 The mobile Extreme Air is the only jumper product on the market that uses patented fiberglass pole technology (Flex Pole Technology), allowing operation of the equipment without cumbersome turn buckles and bungee cords. The dynamic fiberglass pole technology supports a wide range of weights, eliminating the mounds of harness sizes and complex bungee-to-weight ratios needed in order to operate other jumper devices. Custom wireless remote control gives the operator freedom and the opportunity to change or enhance the ride at will, giving the power to provide a fun and thrilling experience 100% of the time. The operator has complete control over the participants, allowing young children to bounce freely or provide assistance to jumpers by raising them higher in the air. This product is perfect for corporate events, military recruiting, malls, fairs, farmer’s markets, street fairs, schools, carnivals, fundraising events, marketing and promotions, zoos, resorts, waterparks, schools and anywhere you can fit an air jumper. Setup size for a complete 4 station is 50 feet wide by 50 feet long. A 55 foot area is required to ensure safety of jumpers. Don't have the size to fit this unit? Check out our 2 station. We removed the 2 outer stations to reduce the space needed. A $1 per mile ($25 minimum) travel fee applies to this item.